Does the world need another spectrum analyzer? The worst tool in your toolbox is the one you don’t use. I found myself pondering that point when the fine folks over at Oscium sent me one of their WiPry-Pro Spectrum Analyzers – purpose built for iOS. While I don’t want to turn this into an Apple vs Android conversation, I personally use an iPhone and when I temper my tools needs with the devices I use (or am reluctant to use), the WiPry makes for a very handy first exposure tool. Now, many Wireless LAN Professionals will argue the merits of triage using a protocol analyzer vs a spectrum analyzer – my take on that piece of the problem is that you should be able to effectively use whatever is at your fingertips. 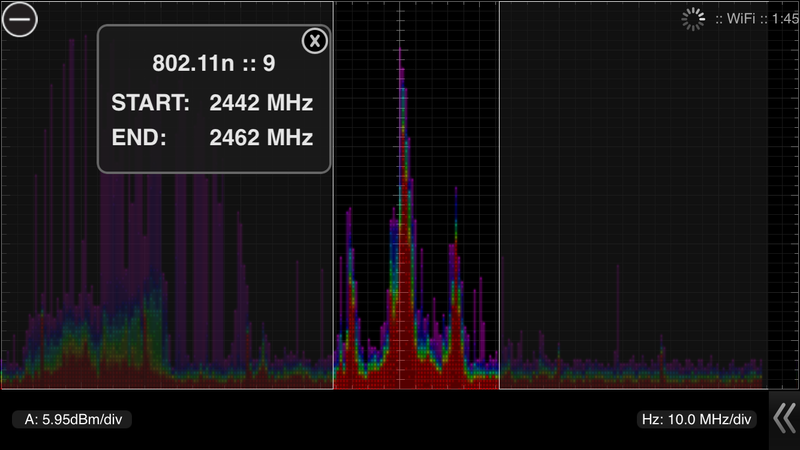 The Oscium solution makes the spectrum analyzer very rapidly available for casual, at a glance, look at your network as well as a good indicator of where you should go next. 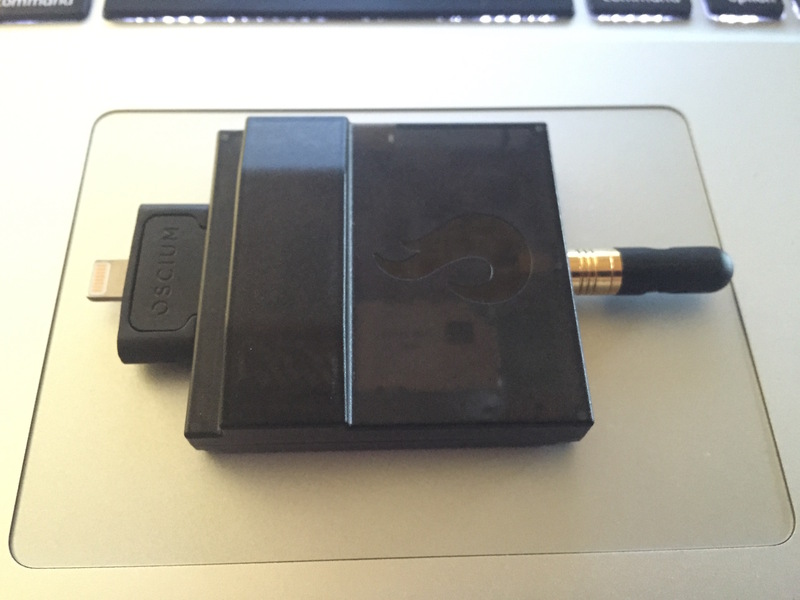 Out of the box, the device is very intuitive with a lightning connector on one end and an SMB antenna port on the other end. 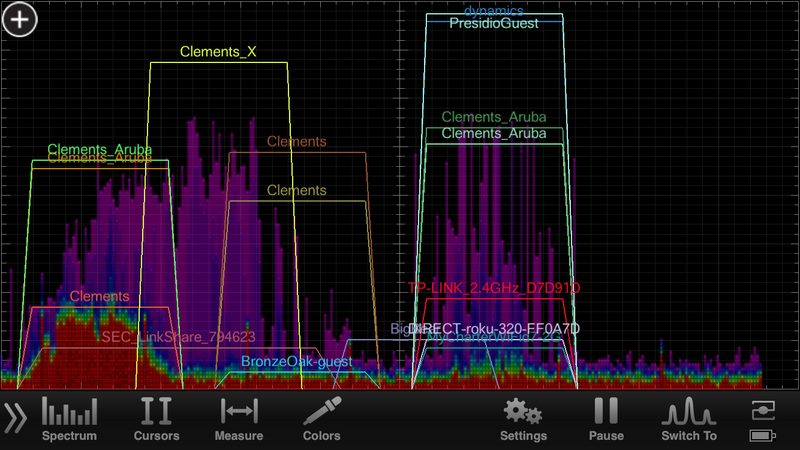 When you attach the included antenna, and download the WiPry app from the app store, you get a good look at where most people head first – Layer 1 visibility into the 2.4GHz spectrum. With specifications similar to other similar solutions, it get’s the broad visualization done in fairly short order. You can see here an analog video camera with their channel 9 mask on to highlight the interesting slice. One of the great additions that the WiPry brings to iOS is the ability to bring interesting bits into one view – like SSID names. I know of plenty of people that prefer the Android platform for this one ability. Now that we have it in a handy to use format wrapped around tons of Layer 1 data, I’d consider it a pretty compelling reason to stick with iOS. In short, the form factor of the card, the usefulness of the data presented, and the Open API component of the app makes this at the top of my list for my next purchase. I’d recommend you go look at one too. While you’re at it, they have a sweet lineup of Oscilloscopes and Logic Analyzers. They’ve brought a whole lineup of analyzer products to iOS and I for one am keen to get much more hands on time with them. Does the world need another spectrum analyzer? For my iPhone, yes – making it the best tool in my toolbox; the one I use.